Dr. G. Gopal, Lecturer, R.V.S.Homoeopathic Medical College shares his experience on a skin disorders which was treated during his post Graduate study at Fr. Muller’s Homoeopathic Medical College,Mangalore along with his under graduate interns Dr.Agnes and Dr.Diana . When I was doing my post Graduation at Fr Muller Homoeopathic Medical College, a male patient aged 35 years, came to our out Patient Department. 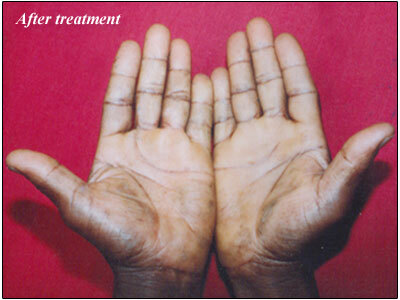 He was suffering from Dyshydrotic Eczema since three years and had been treated by various systems of Medicine. 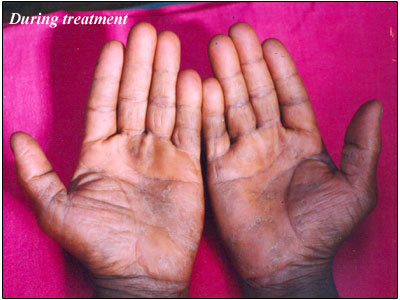 He presented itching eruptions on palms and soles. 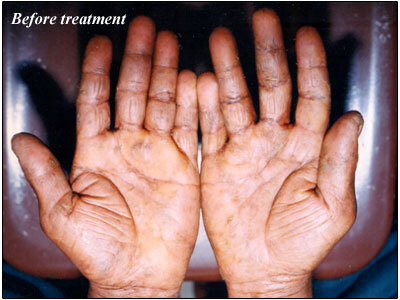 The lesions were with burning, moderate scaling and blackish discoloration without any discharge. The skin was dry and cracks were present in both the arms and sole. The complaints became worse in winter and was better by hot water application. He was dark complexioned with thick, dark hair, soft-spoken, mild and friendly in nature. All other symptoms like (desires, aversion, perspiration etc) were lacking. The mental symptoms were also not characterized. But we could trace some stress in his mind. As the physical and particular symptom was much characterized than physical general and mental symptoms, this case was repertorised in Boenninghausen’s characteristic and repertory by Boger. Followed with placebo b.d for two weeks. All the symptoms are disappeared. No new leision. Sepia 50 M, 1 dose given to take after 15 days. The case was observed for two months. No complaints. First prescription started with 200 to avoid aggravations. Each potency showed its own penetration of tissue. The single remedy is followed through out the treatment period. The repertorisation done after careful analysis of symptoms. Sulphur was given as a Miasmatic.